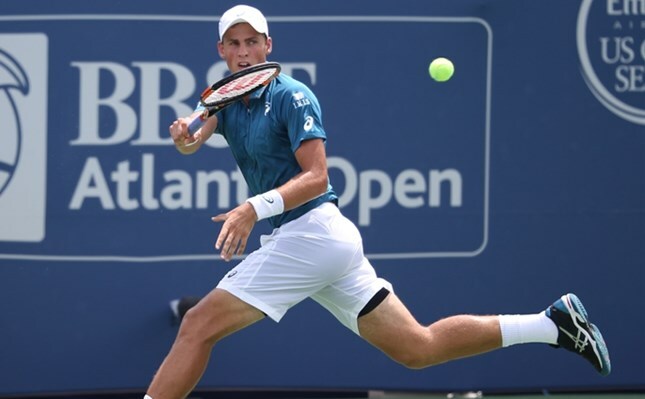 Even Vasek Pospisil was unsure how he fought off cramps, a wrist injury and some of the hottest conditions on the ATP World Tour to advance to the third round of the BB&T Atlanta Open on Wednesday afternoon. His victory was definitely in doubt at times. Pospisil, the No. 2 seed, broke Lu and held to win a relatively routine first set. But in the second, Atlanta in July – high humidity and temperatures in the high 80s – affected Pospisil. After he lost the second-set tiebreak, he walked off the court to use the restroom and splash water on his face, attempting to summon energy for the final set. Throughout the match, Pospisil looked to be suffering from the conditions more so than Lu. Pospisil sometimes leaned on his racket in between points and occasionally staggered around the court. “There aren’t conditions like this on the tour… Just a handful of tournaments that can get this hot,” he said. He also leaned on his serve. Pospisil finished with 24 aces. And when he needed to find whatever energy he had left, he did. Ahead 5-4 in the third set, Pospisil blocked out the heat, the occasional cramps, a nagging wrist injury and darted around the court as Lu tried to serve to stay in the match. Pospisil then broke Lu. Two and a half hours after he started, Pospisil could finally retreat to where everyone in Atlanta wanted to go: air conditioning.